The other day I arrived to a shoot a bit early, so I decided to rest my eyes awhile. I leaned against the steering wheel of my husband’s truck and closed my eyes and sighed. I was tired, I could barely stay awake on the drive into Fort Wayne. I was overwhelmed, I have an edit list a mile long with no end in sight. I was praying, praying that God would help me get through all that life brings my way. Then, I was startled by a tap on my window. Caught off guard, I couldn’t figure out how to open my window, so I just opened the door….to find a woman standing outside my truck. I thought maybe she needed directions, or heck, maybe she was going to ask me for money (not that I would have been helpful with either!). But what came out of her mouth really took me by surprise. She said, “Girl, you look so depressed. It’s not that bad. Someone always has it worse than you. God loves you girl”. And with that, she smiled and walked away. I didn’t really know what to say, I was seriously sort of in shock. ( And to think, I thought I just looked tired, but now I looked depressed…jeesh!). I thought it was strange for someone to come out of their way to tell me that…but was it really? I’m pretty sure it was God using someone’s voice to speak to me, to tell me that He is with me no matter what. And for the following week that I had, it was a message that I kept close to me. My youngest son Reece was in the hospital two nights with a terrible case of croupe (a virus that makes your throat close up), and during that time, I had a peace with me. I knew he was going to be ok. I knew it could always be worse. One of the nights around midnight, I went to the snack room (thank you God for blueberry poptarts! ), and there was a young couple standing outside crying because their little boy was sick. I so desperately wanted to say to them that it was going to be ok, that God loved them, but I just simply couldn’t do it, I was too scared. I wasn’t brave like the woman who tapped on my truck window. I pray that you are open to see the little “taps on your window” this week….to be able to hear God’s message through others…and maybe you’ll be the person tapping on someone else’s window. I’ve had this post in my head for several months now, but I could never quite get my thoughts together (so forgive me if I go all over the place..). Something has been consuming my mind for quite some time….it’s the thought of never being “good enough”. As a mom, as a wife, as a friend…I’m just not good enough. I think we as women put so much pressure on ourselves to be what the world sees as perfect that it makes us start to go crazy. 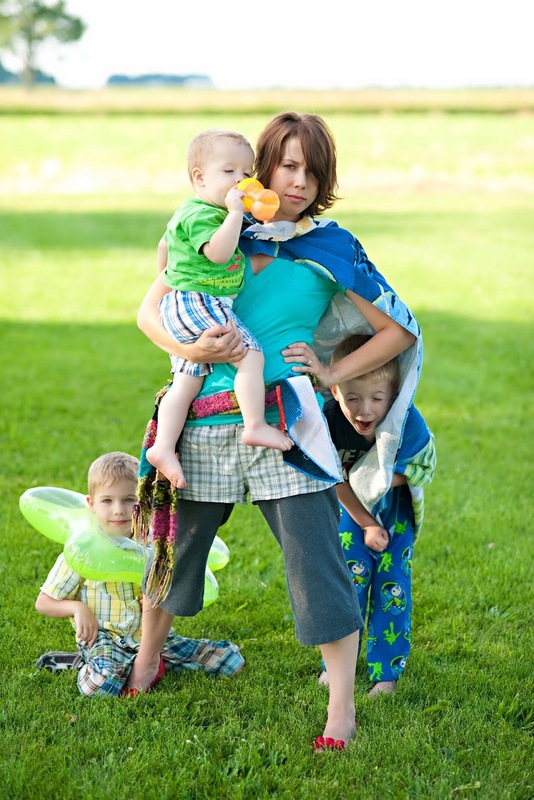 We want everyone to think we have it all together, that our house is always clean, and that our children behave like angels in public…..We rush around and pick up the house for an hour, only to say to our friend as they walk through the door, “oh, excuse the mess, the house is such a wreck.” …..why do we do this?! I think it’s time to give ourselves a break…..I’ve had so many expectations for my life that I’ve simply failed…and with each failed expectation came new realizations about myself. My Failed Expectations……1). 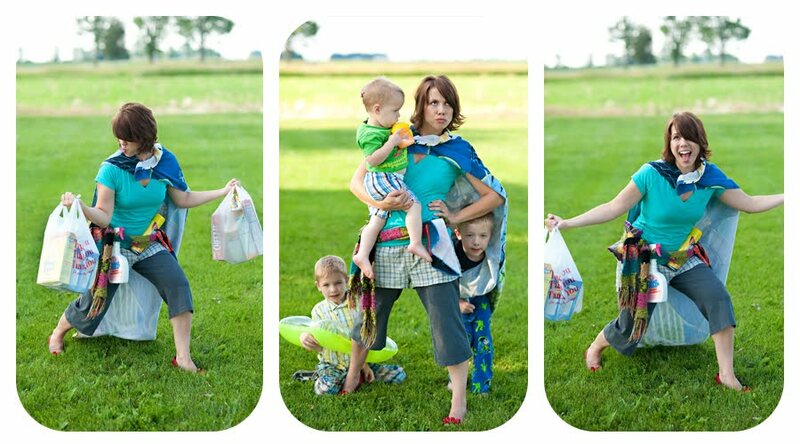 I’ll be the best mom ever…. Before I had children, I pictured myself holding them, loving them, reading them stories every night, and having picnics. No one told me I would become the poop wiper, throw up cleaner, booger picker, referee, tired mom that I am. I thought I would have scheduled “school time” throughout the day, craft time, and make healthy snacks. (insert laughter here). I’m lucky if all three of my boys get their teeth brushed and change their underwear everyday. I sometimes resort to using tasty treats as a bribe for good behavior, I yell way more than I should, and my youngest will probably never talk because I don’t read to him as much as I should…. 2). I’ll be the best wife ever…..
I’ve never been Betty Crocker, so why did I envision myself making lunch for my husband to take to work?? Has it happened in the last nine years? nope. I have great intentions of having fabulous dinners ready for him when he gets home, but by the time 5pm rolls around, I’m usually calling in for a pizza. I thought we would stare into each other’s eyes like some romance movie and take long walks after dinner (the dinner that I purchased….). And although we stare at each other sometimes now, it’s usually because one of us farted or said something stupid….not because we are dreaming of our eternity together. I thought I would wear makeup and pretty nightgowns….unfortunately, I am usually adorned with my husband’s fleece pants and a t-shirt. The sound of my cracked heels scraping across the sheets is the only thing that wakes him up…. 3) I’ll be the best friend ever…..
We all have a friend that we can go a year without seeing and when we do finally see them, it’s like we just saw them yesterday. I wish all friends were like that. Friends take work. And just like my laundry gets away from me, so does taking the time to call a friend I haven’t talked to in awhile. It’s easy to just stay in my own little world…besides, I’m sure everyone else is just as busy as me, right?? It’s not the same to text or facebook someone as it is to send a card or bring a meal. So why do we think we have to be more than what we are? Who is putting all this pressure on us? the world, our friends, or is it just us putting pressure on ourselves? Why do we play the comparison game? So, I challenge all of you out there to look yourself in a mirror and say, “I am perfect just the way I am”. Is my life what I “expected”? No, it’s not…..it’s much more!!! More than I could have ever dreamed. I am blessed beyond a doubt and I wouldn’t trade any of it! Superwoman you say? Why yes, maybe I am….just not quite the one I thought I would be. Have you ever driven by something a million times and never noticed it? It’s like one day it just catches your eye and you think, “How did I not see that before?”… Well, that happened to me today, but it wasn’t with an actual “object”…it was with a prayer. Let me just say, if you ask God a question…you can’t be afraid of the answer. He gently pointed out to me that just because I’m not feeling the “joys” of blessings, it doesn’t mean that I’m not blessing others. We all go through high and low points in our lives, but have you ever considered that the hard times in your life will somehow help you to bless another? Maybe you’ve had a miscarriage and you just can’t understand why it happened, but then a year later you find yourself holding the hand of a young mother who just lost her baby. Maybe you’ve lost a loved one to cancer and you find yourself being the shoulder your friend cries on when the doctors tell her she has stage three cancer. Maybe you’re the person who was abused growing up and you find yourself sharing your story to others that are where you used to be…..
During hard times, it’s not easy to see how you are being blessed, but it doesn’t mean that God isn’t going to take your pain and your struggles, and be able to help someone else who is hurting, someone else who is going through what you already went through. So, am I still going to pray for God to bless me, so I can bless others?? The answer is yes, because if just one person is helped as a result of my suffereing… then it’s all worth it. It’s crazy how God can speak through the silliest things. Some may chalk it up to coincidence, others may say I read into things, but I say it’s the Holy Spirit working in me. This morning I was making my bed (a rare phenomenon here at the Morehead residence! ), and a long piece of thread was hanging off of the mattress. I started to pull it, thinking it would just break off, but you know how that story goes…..It just kept unravelling and unravelling and made me ticked off! Finally, I wrapped the string around my hand and pulled with all my might. “There! I got it! !” Indeed the string was broken and lying in my hand, but it wasn’t until a few seconds that went by that I realized it didn’t come without consequence. The string had cut my fingers….deep, I just didn’t notice it right away… but then the pain came. 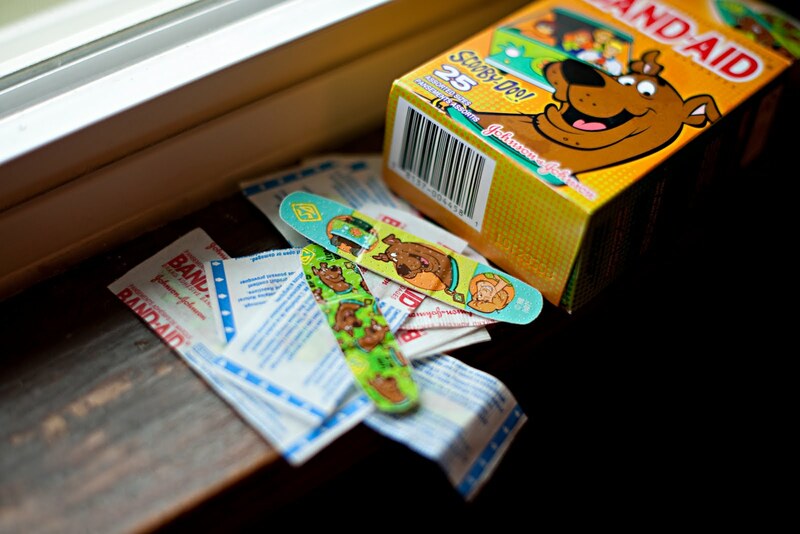 I went downstairs and put some trusty neosporin on it and covered it with an all too cute ScoobyDoobandaid (the only kind a mother of three boys could ever find in her cupboard). Then it hit me like a ton of bricks…Sometimes in our lives, we try to fix a problem and it just seems to spiral out of control. The more we try and handle it on our own, the farther we get pulled off of the main path. And once we finally get the strength to take control (by giving our struggles to God!! ), it doesn’t come without pain. But, there is good news friends, after the pain, the healing can begin!! ScoobyDoobandaids can’t take away all of our pain, but there is One who is the healer of all. Today I am putting my trust in the fact that I am a child of God and that no matter what comes my way, I have the toughest bandaid on in the world!! I’ve always been the “funny one”, the one that makes a fool of herself to get a laugh. I don’t know why I feel the need to make people laugh so much, maybe it’s because when there is no laughter I get drug down into somewhat of a scary place…a place that is filled with a certain darkness and self doubt. I’m going to be completely honest with you,…. I struggle with depression. “What? !”..you say. “You have so much! You have the best husband in the world, three adorable kids, a great job, and most of all a God that laid down his life so that you could spend eternity with Him in Heaven!! Yes, yes, I’m aware of all of my blessings and I’m very thankful, so VERY thankful, but yet sometimes I can’t rise above the heaviness that pulls me down. I feel like a failure so many times because I DO have so MUCH to live for, so much to make me happy, yet I find myself wanting to curl up in a ball and cry….I think to myself, why can’t I shake this? What’s wrong with me?..the answer is…nothing. Nothing is wrong with me, I have a chemical imbalance and it’s ok. It’s ok. God loves me and His mercies are new every morning….EVERY morning. I hope you don’t think I’m a “crazy”, because I’m not. (or at least I don’t think I am, lol…) It’s not like I walk around in a constant state of depression, I have more of a seasonal depression. So, if you see me walking with a big, bright light around my neck in the winter, you’ll know why! Also, depression can manifest itself in many different ways. Some people start harmful habits (which, I did…but that’s for another blog post for another day), and some people are just down right angry. So, why did I share my hidden secret that only my close family and friends know about?? I don’t really know why, but maybe you do….maybe you’ve found yourself feeling down and lonely. Maybe you’ve reached the end of your rope and you think you can’t make it another day….But, you can rest assured that there is Hope. There is hope in Jesus Christ… (and Prozac!). See…there I go trying to be funny again…. 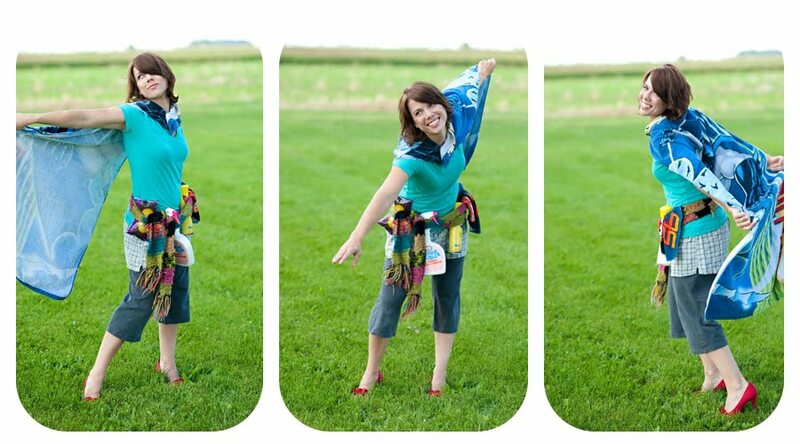 Even though I sometimes feel this way….it’s not how I feel the majority of the time, I usually am truly joyful. But when the darkness does start to pull me under….I pray. I pray for God to protect me from my emotions…from the lies that fill my head. If this is you, please seek help, because you’re not alone. Talk with a friend, your pastor, me…talk to someone. I apologize for being so depressing (great choice of words, I know! ), I promise next time I’ll talk of puppy dogs and rainbows…but for now I’ll leave you with a song that speaks to my heart…and hopefully it will speak to yours.